So as we close out the month, I wanted to finish with something that most of the schools I know of are facing right now—IEP meetings. This is the time of year that think is hard for everyone involved in the IEP meeting. Teachers are fried, especially since many of them have been doing test prep and testing in the last couple of months. The students are tired, the weather is getting nicer and they are itching for summer. And the parents, by this point in the year, are often anticipating change for their child in the coming year. The change could be a new teacher, a new school, new grade levels, and new challenges. So whether they perceive this year as a good year or not, the IEP meeting still comes with a sense of trepidation because change is hard for everyone (and even more so for their children). So, we have this crazy time of the year and now is when most schools plan to have their IEP annual meetings. What a great way we set the stage for collaboration. When I started consulting for Nova years ago, my supervisor completed her evaluation with me by saying, “Chris always keeps the student at the center of the discussion.” At the time, my response was, “Of course I do…that’s my job.” Now I consider this to be the biggest compliment someone can pay me. Because, over time I have come to realize that this is not as simple a task as I have always thought it should be. It’s not that people don’t intend for this happen…it just does. I was in a conference presentation today and a speaker shared that a teacher she knows says that when meetings get contentious she imagines that the student is in the meeting room with them. Then she imagines what the student would want her to say and do for him. I would say this is an awesome idea to try whether you are a teacher, a related service provider, an administrator or a parent. All of us sometimes lose sight of this important idea. It’s not hard to do as we try to get through IEP season and sometimes share news that others don’t want to hear. For some the IEP meeting is a scary process whatever is anticipated. Over the years I’ve seen a lot of good behavior at IEP meetings, and I’ve seen a lot of bad behavior on the parts of all parties involved. One day when sitting in a meeting, it occurred to me that it is difficult for everyone to appreciate that they all come to the meeting with different perspectives. 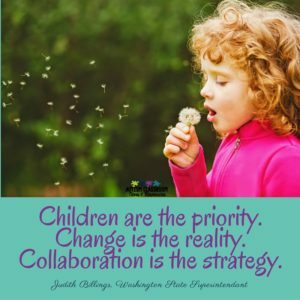 We all are working for the best of the child, but our ideas of how to get there are affected by our experiences and our perspectives. So, being an autism professional, I decided we needed to better understand each others’ perspectives. 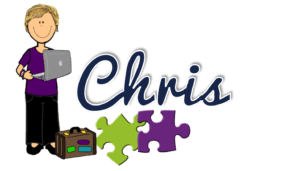 So, I wrote a social story/narrative for understanding others’ perspectives from the IEP team that I will share below. Please take it as somewhat tongue in cheek (and I realize that sometimes students are a participant in the meeting), but it also hopefully reminds us that not everyone shares the same perception of the same situation. 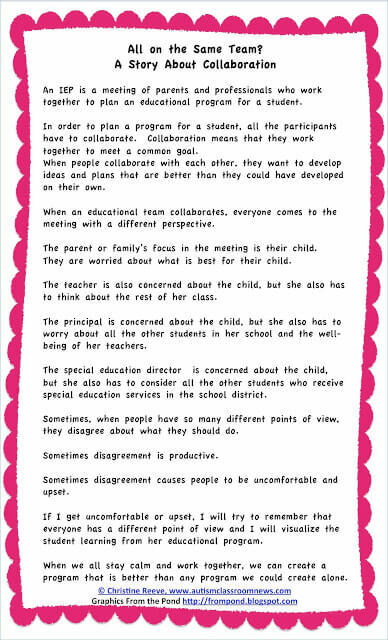 This post would be ridiculously long if I shared all the things to think about in working cooperatively as an IEP team and that is not my intent. 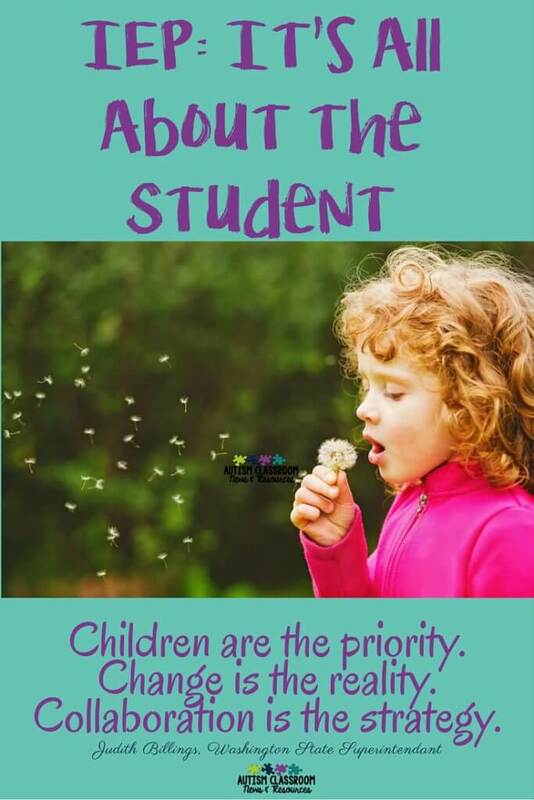 Instead, just remember to keep the student at the center of the conversation and although we may not all agree, those disagreements can make the student’s plan a better stronger plan through everyone’s collaboration. 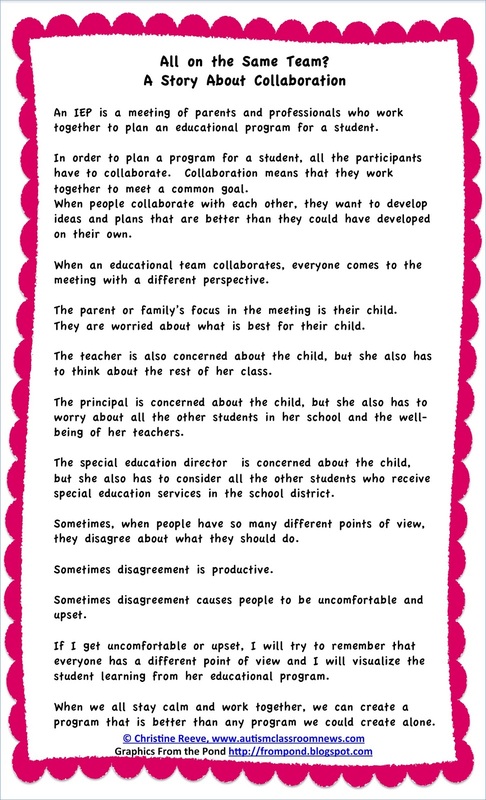 So what are some ways that you encourage collaboration and keep the student at the center of discussion?